Last week, I first heared about React Native Ubuntu. I thought: That’s awesome - Now I can develop desktop applications for all major operating systems (since there is also a React Native Windows and React Native MacOS). So I had to give it a try. The only problem: My main laptop is running Fedora, and I do not want to switch to Ubuntu just for toying with a new technology. Well, I tried anyway, and I was pleasantly surprised that it was not very hard to set up. (Wouldn’t it be really cool if Canonical and RedHat would work together on react native and renamed it to “React Native Linux”? Tell them!). So, the developers really want me to modify the global environment on my laptop? I won’t do that. Especially not for playing around with a technology that I might not even need. The thing is: If your library requires me to install anything globally on my development machine, you have a coupling problem. Which is an architectural problem. Go, fix it. 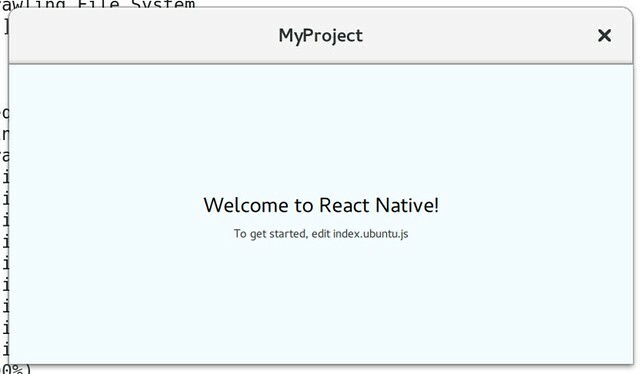 Well, let’s just try to install react-native locally, in a directory where I want to create my example application (“example”). “path/to/react-native” is the directory where I’ve checked out the ubuntu branch of react-native before. And now our react-native app is running! Isn’t it awesome?